Inflammation is redness, swelling, pain and discharge. Peritonitis is inflammation of the lining of the abdominal cavity. The most common cause of peritonitis is bacterial infection, which is introduced into the abdomen from an external wound, or more commonly from a perforation of an internal organ. The intestines or stomach may perforate and leak bacteria into the peritoneal cavity as a result of a tumor of the intestines or stomach, which weakens and ruptures the bowel. A perforating stomach or intestinal ulcer and associated peritonitis can be caused by an adverse reaction to certain types of medications (steroids and nonsteroidal anti-inflammatory medication). Other causes of peritonitis may include liver abscess, inflammation of the pancreas (pancreatitis), rupture of the gallbladder or bile duct, rupture of the bladder, rupture of an infected uterus (pyometra), previous abdominal surgery and viral infection in cats (feline infectious peritonitis). 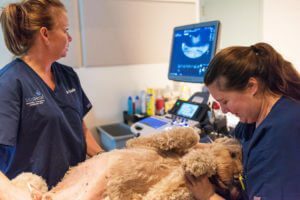 Primary bacterial septic peritonitis is a very uncommon condition in dogs and cats in which there is no underlying cause for the infection in the abdomen. It is possible that this type of infection is transferred from the mouth via the blood stream to the abdomen in these patients. In many cases, the patient will be seemingly well and then suddenly become very ill. Signs that may be noted at home include weakness, rapid respirations, vomiting, loss of appetite, diarrhea, black stools, and unwillingness to lie down or assuming a “praying position” (hind end elevated with front end and head lying on the ground). 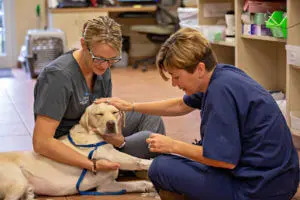 Signs that may be noted by your veterinarian include fever, low body temperature, pale gums, jaundice, rapid heart rate, low blood pressure, fluid in the abdomen, pain upon palpation of the abdomen, and potentially a mass in the abdomen. The diagnosis of peritonitis is based on clinical findings and analysis of fluid from the abdomen. Ultrasound may be needed to assist in collection of fluid from the abdomen. The fluid will contain inflammatory cells called neutrophils and in some cases bacteria. Tests done prior to surgery may include a complete blood count, blood chemistry profile, and urinalysis to evaluate the health of the internal organs. Chest X-rays and abdominal ultrasound may be recommended to rule out internal organ cancer. Exploratory surgery and correction of the underlying problem (ruptured bowel, ruptured gallbladder, ruptured bladder, etc.) is the key to the treatment of peritonitis. If no perforation of the bowel is present, the peritoneal cavity is rinsed with sterile saline to help eradicate the infection. At the discretion of the surgeon, one or two drains may be placed in the abdomen. In some cases, the abdomen may still be left open (with a bandage applied to keep the organs in place) to allow the infection to efficiently drain. A feeding tube may be placed in some cases. After surgery, intravenous fluids and antibiotics are administered. Commonly, plasma transfusion or administration of artificial plasma is needed to help your companion recover. Most patients remain in the hospital for three to seven days after surgery, during which the drainage tubes will be removed. Chemotherapy may be recommended if a malignant tumor is removed from the abdomen. These treatments are typically started two weeks after surgery and performed on an outpatient basis. They may take a total of 90 minutes to complete each visit. Unlike humans, most dogs do not lose their hair and usually have only mild side effects from the medication, which may include transient loss of appetite and vomiting.